Despite unhappy farmers, the French government has decided to let returning wolves prosper, a little. Wolves were wiped out in France in the 1930's, but in the 90s wolves from across the Alps returned to repopulate the country. Currently there are about 360 wolves living in France; the government will let that population increase to around 500 by 2023. Wolves are a protected species under the Bern Convention to which France is a party. Non-lethal means of guarding livestock, mostly sheep, has been demonstrated to be viable. Guard dogs are effective in deterring wolf attacks on sheep, as are shepherds in the area. Penning ewes that are about to lamb also reduces mortality. Hunters will still be allowed to cull 40 wolves this year, the same as in 2017. [photo] That rate could increase if predation becomes more pronounced in future years. 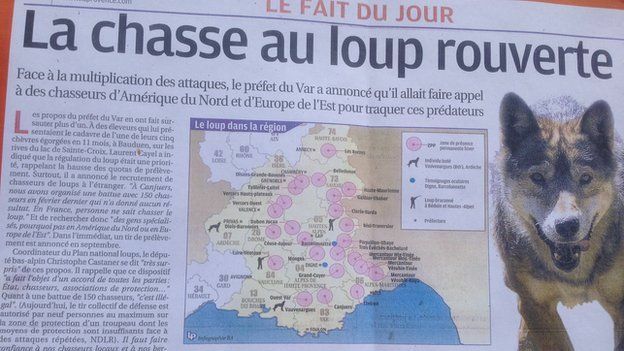 The government has sent specialist teams into the Alps to hunt wolves deemed to be a problem. Last year a reported 12,000 sheep were killed by wolves. Farmers are compensated for each confirmed predation; the bill amounted to €15m in 2012. A wolf tracker says the wolf is well adapted to its environment, intelligent, with superior senses, so it is not surprising the wolf is making a comeback in parts of Europe where it was eradicated. 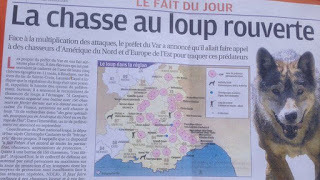 There are now wolves among the vineyards of the Champagne region, and there are wolves 160km (100 miles) east of Paris. When it learns something, it remembers the lesson and teaches it to its offspring. Conservationists advocate return of the wolf, an apex carnivore, as necessary to reestablish balance in nature disturbed by man.